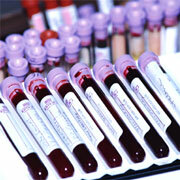 Blood work needs to have the bloodstream as clean as possible to get an accurate reading. Sip the smallest amounts of water possible just to wet your mouth and nothing else. For an operation you cannot even drink any liquids for hours before the operation. I was turned away from an operation on my foot for drinking 1/2 glass of water, 2 hours earlier. As far as a blood test determining triglyceride levels is concerned, for 12 to 14 hours before the test, only water (no coffee!) is permitted. Overnight fasting is essential for an accurate measurement of blood triglycerides! In addition, alcohol should not be consumed for the 24 hours just before the test.